With two ballrooms full of purple stained teeth as far as the eye could see, I set out to taste some of the beautiful wines of Ribera del Duero at the recent Grand Tasting event in New York. At my count, there were 85 Vineyards represented, with each showing multiple wines. In addition to the sheer volume of vineyards present and wines being poured, Ribera del Duero wines are big, and it’s easy to quickly fall prey to palate fatigue. It’s too bad I had to break up my tastings with a little bit of lomo, Spanish cheese and Spanish almonds. Before we go into the goods, I always think it is a good idea to know what we’re tasting. 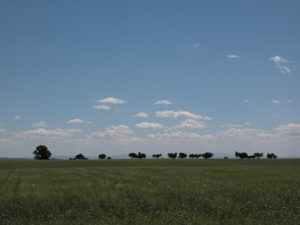 Ribera del Duero is located in Spain’s northern plateau. It’s not too far from Madrid. Ribera literally means “river bank” and runs horizontal to the Duero River Valley, hence the name. The soils range from alluvial with sand (closer to the river) to alternating layers of limestone, marl and chalk (at the higher elevations, some vineyards are as high as 3,100 feet above sea level). The region has very hot summers with cold winters, which benefit the grapes. Varietal: Tempranillo is the primary varietal used for Ribera del Duero. Tempranillo ripens early (temprano means “early”). Sometimes, it is known as Tinto Fino or Tinta del Pais. With Tempranillo, expect flavors such as black plums, cherries and licorice. Ribera del Duero is a D.O. (Denominación de Origen). This means wine laws highly regulate the density, yields, pruning, alcohol levels and labeling. Expect a certain level of quality similar to that of A.O.C. regulated wines in France. Critical vocabulary for this region: How can you tell how old the wine is? Joven – Joven literally means “young.” It is wine, which may or may not have spent time in a cask and it is bottled in the year following the vintage, for immediate release. Crianza – These wines must have aged for at least 2 years, with a minimum of six months of that time spent in casks. Reserva – Typically from better vintages, these wines are aged for three years, with a minimum of one year of that time in casks. Gran Riserva – Wines of exceptional vintages, Gran Riserva wines are aged for five years, with at least two years of that time in oak, followed by bottle aging. This was one of my absolute favorite finds at the event, with some of the Crianza wines getting 92/93 ratings in the past with a low $20 handle. I spent some time with Cristina Callejo Calvo, their Export Manager and member of the family. Cristina shared that their goal is to “bring out the individual character of their vineyards, with the highest regard for terroir.” All of their wines listed below are 100% Tempranillo. 2005 Félix Callejo Selección de Viñedos de la Familia: RP 97+, $115, The song “Lilac Wine” came to mind as I tasted lilac with some dark chocolate after notes. This was really tasty and elegant stuff. 2006 Callejo Riserva: RP 91, $45, cherries, coffee, elegant. I really enjoyed. Bodegas Condado de Haza, S.L. 2001 Alenza Gran Riserva: (100% Tempranillo) WS 92, $100, Named after the winemaker’s wife, and produced from their riper vintages. This was such a treasure. 2005 Máximo de Arrocal Gran Riserva: (100% Tempranillo) 93 ST, $100, Needs to breathe a bit, but for the Bordeaux lovers, this one will appeal. 2009 Rosa de Arrocal: (50% Tempranillo, 50% Albillo) $8, A nice rosé, with lots of strawberries. Perfect for a hot summer night. I have to give a shout out to Despaña, a specialty Spanish food store in New York. I love this place! They were present at the event with plenty of lomo to go around. As I said before, give me a plate of Pata Negra (Jamón Ibérico) and lomo, along with a great Rioja or Ribera del Duero, and I could be 100% content to watch the world go by. * Mr. Peñalba prefers the name of the Estate precede the name of the producer. Photo provided by Mathias Berenger.